25% off sublimated basketball uniforms and customizable jerseys, minimum 12. Discounted prices shown below. All lettering and logos are included in the price, in as many colors as you want, even the individual's name on the back. 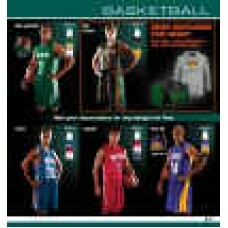 Looking for basketball uniforms in custom colors? No problem, you've come to the right place. You can use any color combinations you want, all colors are available for your custom basketball jerseys. Design your own Prosphere ADV custom uniforms and custom jerseys online. If these are beyond your price range, try the stock basketall uniforms that can ship today. You can add custom lettering to the baseball uniforms. Size chart Features : 6 assorted items , .. Size chart Features : Diamond cut neck insert for mascot / logo customization , Full cut length and .. Size chart Features : 4 assorted items , .. Size chart Features : Drawstring waist , Zipper leg opening , Side pockets , Straight leg .. Size chart Features : Contemporary look and comfortable feel , Great for sideline wear or promotiona.. Size chart Features : Unique design on each side , PerformanceTech fabric keeps you cool and dry , 1.. Size chart Features : Versatile jersey , Jersey reverses to white except in two-color combinations ,.. Size chart Features : PerformanceTech fabric keeps you cool and dry , Shorts reverse from solid with.. Size chart Features : Opens on bottom for easy lettering , Reinforced construction , Tailored womens..